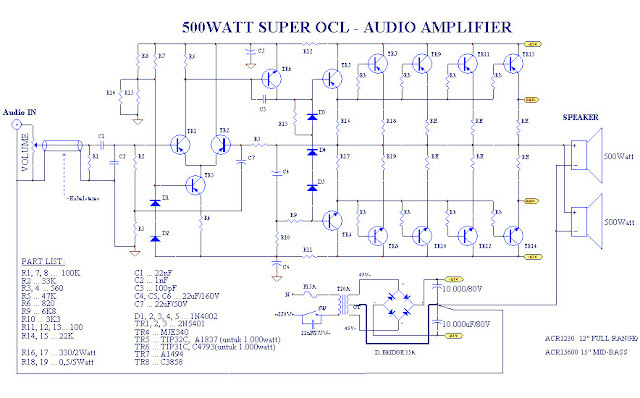 Power Amplifier 500Watt RMS. 3 transistor bolted on the PCB board is not hot, just a single model. At the start of designing a pcb, three transistors is mounted under or bolted on the main pcb heatsink and the circuit is set closer to class A. Three-base diode base was willing to be used as a heat sensor, but it is hard mounted on a heatsink. Trails ground should not soldered on pcb, fire ground at the foot of two pot volume (stereo), is to avoid drone / hum. 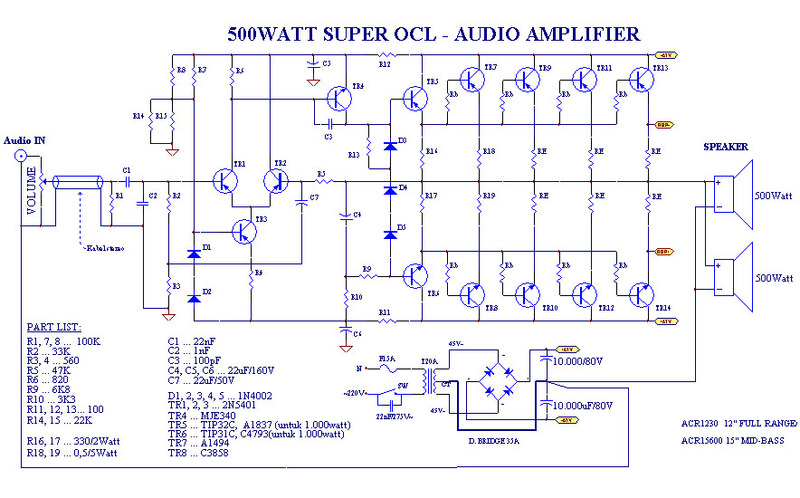 This amplifier 500watt rms with a maximum power supply voltage at the load 45vct 2x speakers. PA3600w on par with other assemblies amplifier. Power supply Power Amplifier 500Watt RMSTransformer with a current strength of at least half of the nominal voltage, to compensate for a 4 ohm load 2x (4x speakers) such as stereo amplifiers professional standards, eg transformer 40Vct 20Amper. 40vct minimum supply voltage, if rectified would be more than 50vdc, transistor-power transistors will release energy (more life) if supply with 50Vdc voltage (40vct = vac). Speaker using2x 500watt (12 ", 15") per mono block amplifier, speaker total 4 units to 1 stereo amplifier.It is advisable to use a 500W powered speakers (12 ", 15") as much as possible,is more effective in improving the gain of using a large speaker> 1.000Watt (18 ", 21") with the least amount. Transistor Final Power Amplifier 500Watt RMSSuggested use Sanken series 3 sets.Too many final transistors without increasing the power supply transformer can weaken the thump of the bass and the sound is less stable, hoarse etc. Carefully circuit Sanken many forgeries, for example Sanken 2SC2922-5DY (quality is unstable and does not correspond to the price). Transistor driver must also be original! If there is a problem such as a hoarse result, resistor 300 burning, etc. This may be because the component FALSE. C4793 (less character with standard transformer) can be replaced with original TIP31C (artificial transistor st hoping to give more than a spec written) on the condition that the supply voltage is not more than 45vct. Resistors and capacitors do not really matter. The problem is electrolytic capacitors, Elco. Sorry average Elco Rubycon / marcon / Nichicon (original) is less suitable to be applied here, because he is more suitable work in the dc current, which is suitable for this is Elco brand nippon Chemicon (not all), and Elco another stable job at audio frequencies /air conditioning. Almost all the native power amplifier assemblies only 500watt theoretically and practicallyon paper and table test, but in the power of music power is transferred to the speaker only a few dozen watts! Proof: cool heatsink / no heat, sound is loud. Adjust the power speakers with a power amplifier used! Characters and features:Hifi full range with bass gain 2 ~ 4 times the usual amplifier. Effective for the production of such bas-class amplifier h & BTL.Speaker leaves more stable, not too advanced and not too far back even if exposed to shocks bass, speakers and power transistor expectations more durable.The values ​​of the components are set such that the power transformer is more efficient. Power transformer is not wasted, not turned into drone / wild signal / oscillation, etc.Sound can travel long distances in the field due to consider the Doppler effect.With the installation of the transformer model 2 below (test 2013), does not make the slightest hp signal when no sms / incoming call even though hp kept above the transformer, is one of the features, amplifier built-up not necessarily.